I am not an individual who gets star struck. I do not idolize or even much care about celebrities or people of prominence. I was not going to watch the royal wedding last spring; I really would rather have slept through it. I have a very low opinion of monarchies. The wedding was in the middle of the night West Coast time and I didn’t bother to set an alarm. As fate would have it, I woke up with about twenty-five minutes before the procession began. I was big into conspiracy and was expecting some spectacular event to take place. Since I had the intuitive feeling something or someone had awoken and aroused me out of a nice peaceful sleep, there must be something I was supposed to see. I watched Shepard Smith and all the other talking heads babble on and battle about what colors the queen would wear. Then there was look, there is Elton John and that type of jargon. They bet on whether the bride would be on time or would she be late. Of course it’s the bride’s prerogative to be on time or run a tad late. Did anybody really give a damn either way? After ten minutes of this, I was ready to vomit and go back to sleep. A small voice inside me demanded I watch and pay close attention. As the moment approached, my head over-filled with conspiracy ideas and concepts. I thought perhaps a sniper would kill the father of the bride. I considered the idea somebody may have planted a bomb in the abbey. So many things encircled my mind. I was wrong! I hadn’t even considered what my eyes were about to witness. Here came the nice shiny, polished black car. In it was the father of the bride and the bride in a beautiful white dress. This was a Kodak Monarch moment if I ever saw one. Of course, I must mention I was five months away from knowing about my own involvement in MK Ultra, Monarch and MILABS. In retrospect, it’s a Monarch moment if I ever saw one. The most important thing I want the reader to know about this article is the day that was chosen for the royal wedding. We have a calendar consisting of three hundred and sixty-five and one quarter days. The day of April 29th, 2011 was chosen for the wedding. This is the same day Hitler and his bride Eva were married shortly after midnight. These people had the rest of the entire year to choose another date and yet they still chose to get married sixty-six years to the day of Hitler and his bride. This photo has a Monarch look to it. After everybody had entered the abbey, I immediately noticed something. The priests were in colors I did not expect. This wedding was a spring wedding and I thought I would be seeing Easter and spring colors. I would have thought the priests would be in white and purple or something of that nature. What I noticed was shocking. 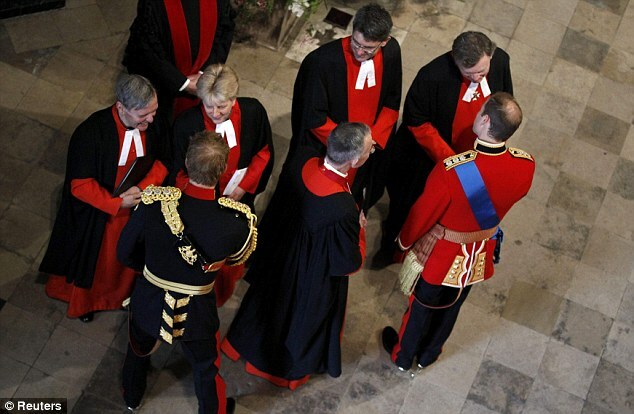 One of priests was robed in red, black and white and the other was robed in red and gold. Black red and white are not colors for weddings. I have not been instructed as to the traditions of the monarchy, but something was wrong with this in my opinion. I had begun to wonder if I was observing a black mass or at least a stripped down concept of black mass. Red and gold are often worn during spiritual warfare. Many times Archangel Michael has been depicted in red and gold while doing battle with the adversary. 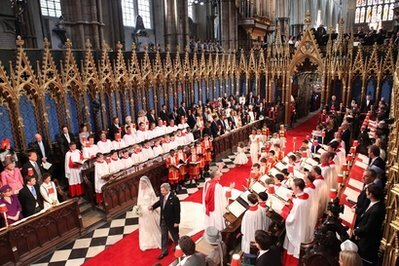 With both Prince William and Prince Harry in military uniforms and one of the priests in red and gold, I couldn’t help but question whether or not there was some sort of declaration of spiritual and physical war for the billions of viewers. 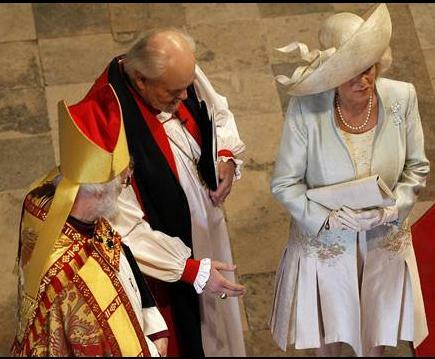 Here is a photo of two priests with who I believe to be Camilla. Notice the colors they wore. Please watch this portion of a video from the movie Eyes Wide Shut. A guest on Coast-to-Coast AM discussed this movie with George Noory. The guest said he writes black masses and said this was a good example if I remember correctly. Notice what color the man was wearing when Tom Cruise got into trouble for being at the event. Hmmm, yeah, it was red and gold. Take a look at the next photo of the choir boys and the colors they were wearing. Once again, red and white and then there is the Masonic black and white checkered floor. I do not get too heavily into Masonic conspiracy, but I have to tell you how Monarch that floor looked to me. High contrast is a huge trigger for me. In this next photo, we have Prince William and I believe Prince Harry mingling with some of the clergy before or after the wedding. Take notice of the colors again. I repeat, this is a wedding and it’s spring. Easter was five days before this event. This next photo is of the boys in the choir. I can’t help but wonder how they were chosen to be in the wedding. I have to ask if they are all Monarch boys. Notice their complexion. They almost seem like they are in shock as their faces are so pale. The boy on the far right could almost pass for a young actor in a vampire movie. I’m probably going off the deep end a little, but given my life experiences, I can’t help but question things. The Queen of England showed up in a creamy lemonish yellow outfit. She shook hands with a man clad in gold and red. It’s an interesting photo even if you don’t find any issues with it. I think I had asked enough of the readers by now. There were billions of people watching this wedding and I conclude there were Monarch and Satanic undertones to the event. I would be happy to hear the opinions of the readers. I wanted to do this article as a YouTube video last year, but that small voice told me to wait. I now know why and I’m glad I respected that.